Enhanced Creatine Absorption for Improved Results! 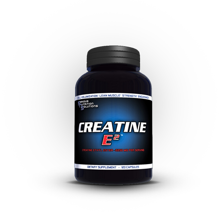 Creatine E2 contains 2.25 grams (2250 mg) of Creatine Ethyl Ester HCI per serving. It can be cost effectively used to help gain lean muscle, strength, endurance, and to improve recovery. Creatine E2 is versatile and can be used whether you are trying to build muscle & lose fat, improve athletic performance, or build the most strength and muscle possible. Creatine Ethyl Ester HCI offers a variety of benefits over many conventional creatine products. Creatine Monohydrate is one of the most tried and true supplements that has been used as a staple supplement by athletes and bodybuilders for years. However, just like many good things, it still has its flaws. Due to he limited absorption of Creatine Monohydrate, many users have to do a loading phase to experience results. Another common method is to use products that have creatine transport systems in them. The transport systems commonly contain dextrose, which even though it can help the body assimilate creatine better, it is still a sugar and can lead to fat storage. Also, Creatine Monohydrate can lead to water retention, bloating, cramping, and dehydration. Creatine E2 utilizes ethyl ester technology to help overcome the downfalls of regular creatine monohydrate. Due to its improved absorption and bioavailability, no loading phase or transport system is required. Creatine Ethyl Ester also does not contribute to the water retention, bloating, cramping, and dehydration commonly associated with many creatine products. No need for dextrose intake associated with many other creatine products on the market. (Dextrose, while useful for some, is still a sugar, and can lead to increased fat storage). Creatine E2 capsules are a cost effective way to incorporate Creatine Ethyl Ester into your training regimen while avoiding the bitter, acidic taste of Creatine Ethyl Ester powder. Most users report less bloating and better results as compared to many other forms of creatine, with Creatine E2 even working well in many Creatine 'non-responders'. Creatine E2 can be stacked with VasoForce XT, Beta Alanine caps, Focus XT, or other Serious Nutrition Solutions products for increased results. As a dietary supplement, 3 capsules twice daily. Take 3 capsules 30 to 60 minutes prior to working out. Take another 3 capsule immediately after working out. Take 3 capsules with your first meal and another 3 capsules 8 to 12 hours later with a meal. For best results, each dose of Creatine E2 should be taken with 8 to 16 ounces of water. Looking to lose weight and shed away ALL that unwanted weight? Fat burners are dietary supplements aimed and specifically triggered at burning the fat that is found within our body. Incorporated with proper diet, they provide PROFOUND mind blowing results. Additionally, with the addition of other key ingredients, they also provide great appetite control, appetite resistance, and great amounts of both focus and energy to battle through the turmoils that exist when dieting. Diuretic supplements serve the purpose of those who are trying to rid their body of excess water weight. They can serve the purpose of an athlete, bodybuilder, and or person who is just trying to rid water weight and bloat from their overall look. Whether you are recomping for a competition, trying to reach a specific weight class, or trying to reduce the bloat/water weight in your body, diuretics may be a great choice for you. For use as a dietary supplement only by healthy adults the age of 18 and over. Do not use this product if you are nursing, pregnant, or attempting to become pregnant. Consult a physician before using this or any other dietary supplement. Do not take this product if you have any pre-existing medical conditions or if you are using any prescription or over-the-counter medication. Do not use BioPerine without physician supervision since it may increase blood levels of prescription medications. Discontinue use and consult your health care professional if you experience any adverse reaction to this product. This product may contain ingredients banned by certain sports organizations. User accepts all risks, liabilities, and consequences in regards to testing. Do not use if safety seal is broken or missing. Use only as directed. Do not exceed recommended serving under any circumstances. KEEP OUT OF REACH OF CHILDREN. Please read the warnings and directions that are posted on the label of this bottle carefully. Nutriverse does not endorse any of the statements made by this manufacturer, and by buying you consent that you are at least 18 years old.